Rat Terrier is an American dog breed. Early 19th century immigrants originated the breed from a mixture of crosses; Smooth Fox Terriers, Old English White Terriers, Bull Terriers, and Manchester Terriers. Later, Chihuahuas, Toy Fox Terriers, and available Feist Breeds were added to the cross. 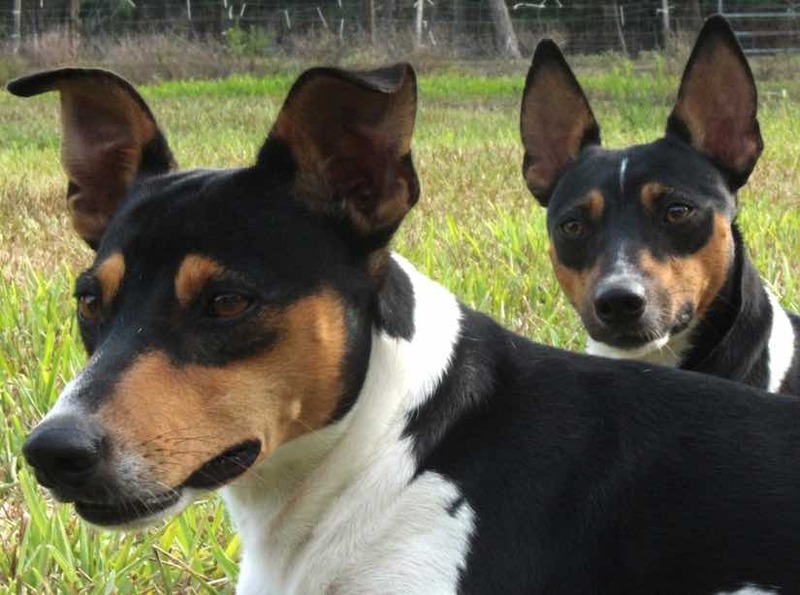 During the 1910 and the 1920s, most farmers owned a Rat Terrier. Rabbits were plaguing crops in the Midwest so farmers began breeding Rat Terriers to Whippets and Italian Greyhounds for enhanced speed in the breed. 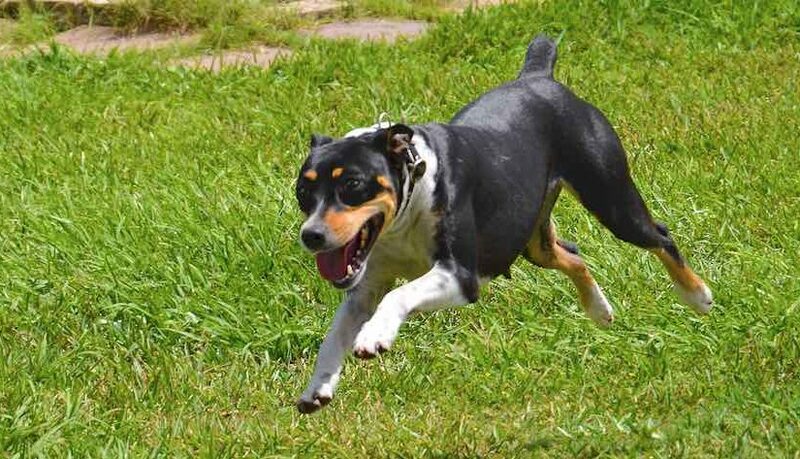 Farmers in the Central and Southern regions bred their Rat Terriers to Beagles to bring out a stronger prey drive and gave the Rat Terrier breed a powerful nose, as well as a good disposition they are known for today. 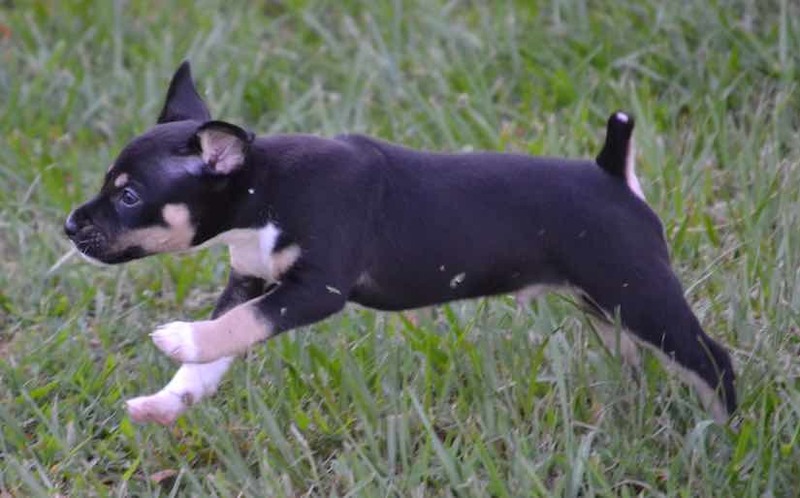 Bred primarily for protection against vermin on the farm or ranch, and not as earth dogs, the Rat Terrier will follow most quarry to the ground but are more suited to trailing, flushing, treeing game and hunting rabbits and vermin. 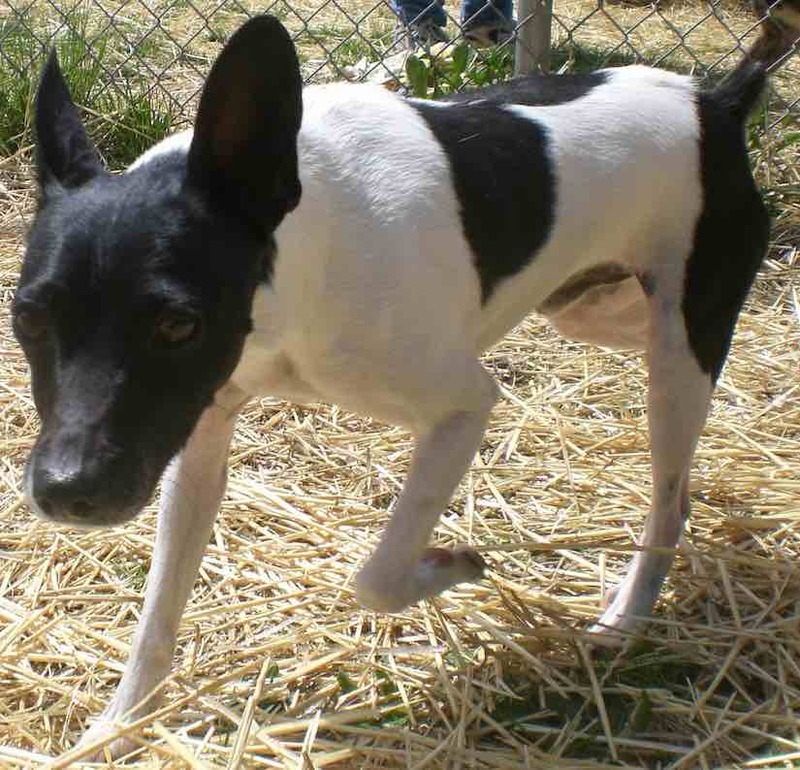 The Rat Terrier is a hard-working farm dog, able to rid an infested barn of vermin with no problem. 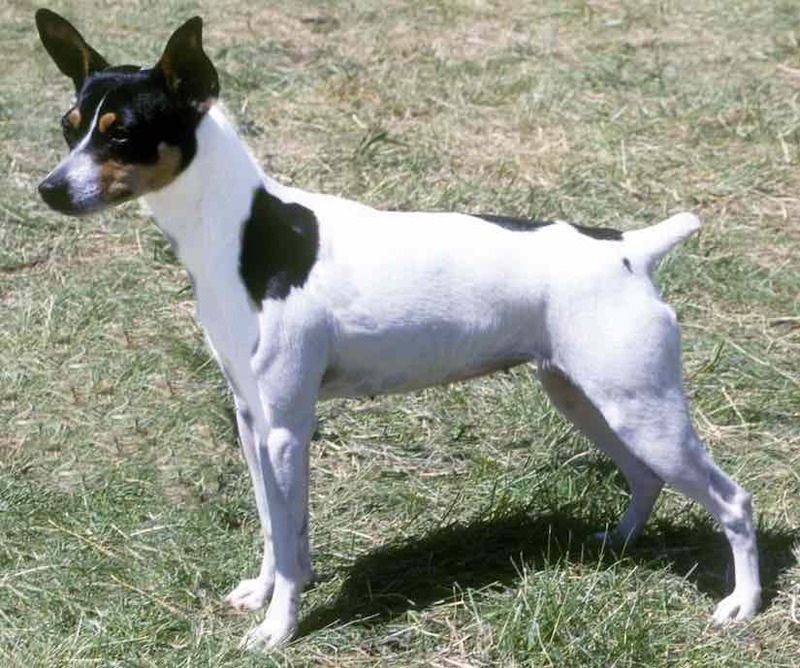 General Appearance: The Rat Terrier was originally bred for ratting and farm work. A multipurpose companion dog that is capable of hunting rodents and vermin above and below ground, and to course small game. He is a sturdy, compact, small-to-medium sized party-coloured dog giving the appearance of elegance and fitness, denoting speed, power, and balance. Honorable scars of a couple of broken or missing canines or incisors teeth are not to be faulted. Keenly observant, devoted, full of energy, yet easily trained and obedient to command. 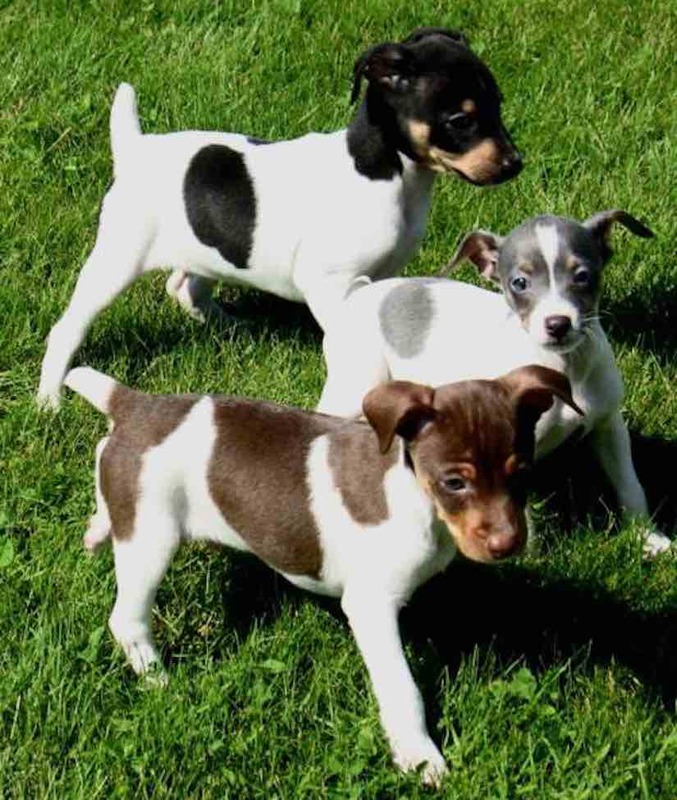 The Rat Terrier is non-sparring breed and generally friendly with other dogs, but may be reserved with strangers. Submissiveness is not a fault. Overt aggression and excessive shyness should be penalized. Miniature Rat Terrier: At least 10 inches, not exceeding 13 inches. 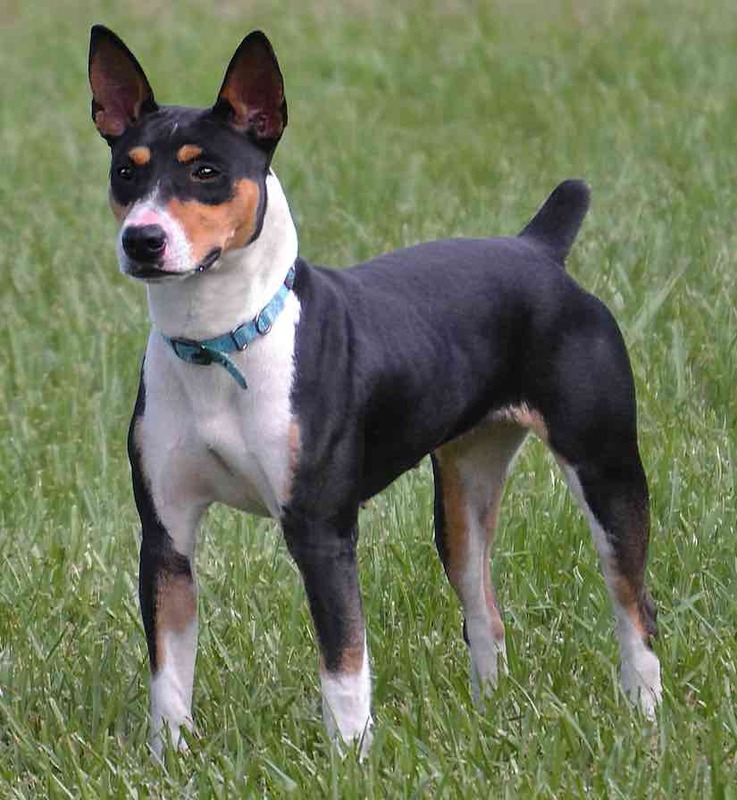 Standard Rat Terrier: over 13 inches, and up to and including 18 inches in height measured at the withers. Proportion: The Rat Terrier is just slightly longer than tall. The height, measured vertically from the ground to the highest point of the withers, is slightly less than the length, measured horizontally from the point of the shoulders to the point of the buttocks. Substance: Moderate bone in proportion to size. A well-balanced, hard-muscled dog with smooth lines under taut skin. This dog should not be rangy nor fine boned and toyish, and never bulky or coarse. They are shown in good, hard physical working condition. Coat: Short, close lying, smooth and shiny coat. Texture varies; a very slight ruff or wave along the back is allowed, but undesirable. Whiskers must not be removed. Colour: Any variation of Pied patterning is acceptable. Pied is described as comparatively large patches of one or more colors in combination with white. 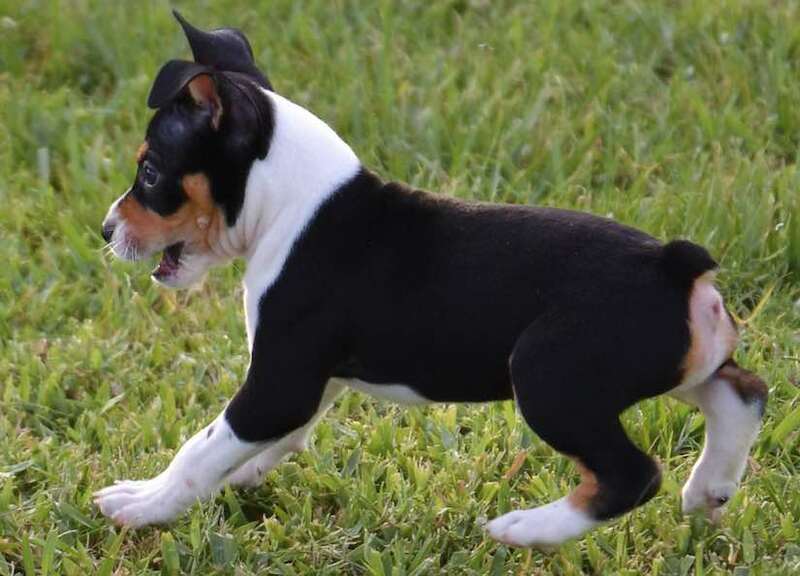 Except for the “solid white” extreme piebald dog with only mottled/spotted skin, Rat Terriers are never a solid ground color without white markings or bi-coloured without one color being white. Acceptable colors with or without “tan points”, include the predominate Black: or Chocolate, Red, Apricot, Blue, Fawn, Tan, Lemon, or White. Intense, dark shades of color with clearly defined and delineated colouration is preferred. White on the body is preferred to be between 10% and 90%, but all Patterns: spotted, patched or splashed with white in conjunction with (or without) any combination of white on the face, head or ears are equally acceptable without prejudice. “Tan Points” are common and vary in shades of cream to rust. Badger markings are acceptable. Speckling, ticking, and mottling are common, but heavy ticking is undesirable. Sable coloring is permitted in the coat or as shading on the head or penciling on the toes. A few white hairs do not constitute an acceptable marking. A minimum white marking consists of a patch or strip of white with underlying white/pink skin on the forechest or body that exceeds one inch. Head: Resembles a smooth, blunt wedge from a front or profile view. When seen from the front, the head widens gradually towards the base of the ears in an unbroken line and is well filled up under the eyes. Eyes: are not large. They are obliquely set wide apart and are oval in shape. Eye color varies with coat color from darkest brown to hazel. Eye rim pigmentation corresponds with nose color and facial markings. Gray eyes are acceptable in blue or blue-fawn dogs only, being a serous fault in other colouration. Ears: Set on the top outer edge or the skull, V-shaped, with the length in proportion to the head moderately pointed at the tip. When viewed from the sides, the base of the ear is on the line with the outer corner of the eye. Should match in shape and carriage when alert, and can be carried erect, semi-erect and tipped, or button without preference. When alert, a rose ear is a fault. Skull: When viewed from the front the skull is moderate in width, relatively flat on top, and rounded at the crown and the sides as it widens smoothly from the corner of the eyes to the base of the ears. The occiput is not prominent. The cheeks are flat and well-muscled, but never bulging. Stop: is moderate but distinct. Muzzle: strong, just slightly shorter in length than the skull and tapers smoothly along the sides to the nose. Nose: color corresponds with the body color and is entirely pigmented. Flesh-coloured noses are considered fault in lemon or light apricot colouration while being a serious fault in other colourations. Season fading is permitted. Lips: are clean and tight, and correspond in color with the nose leather or may be pink; either solid or spotted is acceptable. The lower jaw and teeth are strong and well developed with no sign of being snippy or weak. Bite: scissor bite is preferred. A level bite is acceptable. Neck: Length of the neck is in proportion to the head. Strong, arched along the crest and dry, the neck blends into the flat shoulder blades. Forequarters: The shoulder blades are well laid back with flat muscles providing enough space between shoulder blades to allow for free movement. The shoulder blades and the upper arms are nearly equal in length and well set back so that the elbows fall directly under the highest point of the shoulder blade. The depth of the body at the elbow is the same distance as from the elbow to the ground. The forelegs stand straight and parallel with elbows turning neither in nor out. The pasterns are slightly sloping when viewed from the side. The feet are oval in shape. The toes turn neither in nor out, are compact, moderately arched, with thick pads and strong nails. The front dewclaws may be removed. Body: Topline: smooth and blending from the back through the loin and set of the tail. Body: compact, strong and flexible with well-sprung ribs. Brisket extends to the elbow. When viewed from the front, the ribs appear to be oval. 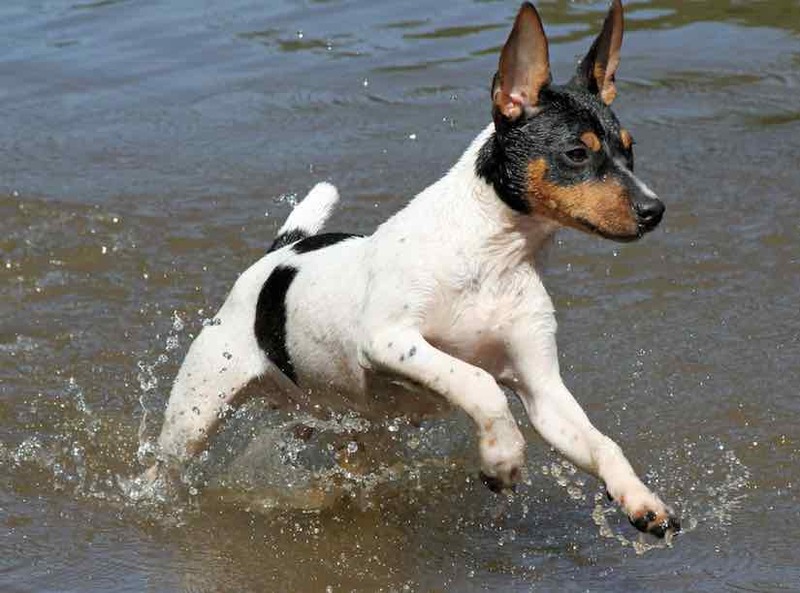 The Rat Terrier, while muscled and fit, has flat muscles that blend into the body. Chest: moderately wide and well filled with a discernible forechest. The underline ascends gradually with the ribs extending well back to a moderate tuck-up. Back: is level and firm from the withers to the loin. The short loin has a slight muscular arch blending into the gently rounded croup. Hindquarter: The hindquarters are muscular but smooth and in balance with the forequarters. They should not be bulging or coarse. Stifles are well bent with short hocks that are parallel and perpendicular to the ground. The hind feet although slightly smaller are similar to the front feet. Rear dewclaws are removed. Tail: The tail is a continuation of the spine. Tails are customarily docked between the second and third joint, or can be a natural bobtail or left naturally long and tapering to the hock joint. Length is unimportant. The carriage is variable depending on attitude, carried from slightly below horizontal to almost erect, but not over the back or a ring-tail. Gait: A ground-covering efficient trot with good reach and drive suggesting agility, speed, and power. The legs are parallel at a trot, but as speed increases, the legs converge toward a center line. There should be no elbowing out, weaving or rolling action while in motion. Faults: Shortness in legs is a serious fault. Flesh-coloured noses in lemon or light apricot coloration is a fault. Disqualification: Any dog over six months of age measuring less than 10 inches, or over 18 inches; Any blue color in the eye; Cropped ears; An absence of coat (genetic hairlessness); Any suggestion of kink or curl, or coat type other than described; Solid colouration (other than white); Bi-colors without white, or dogs with a patch or strip of white measuring less than one inch at its widest dimension; Brindle or Merle color patterns.